When I first arrived in Taiwan, one of my main goals while being here was to learn Chinese. In the beginning, I figured I would automatically learn the language just by being here. So I focused on learning street Chinese – the way locals spoke it! After I began to get serious about learning Chinese in Taiwan, I started attending classes at local language centers. I ended up trying out three different ones to get a feel for the different styles. I found clear benefits to learning Chinese in a classroom setting, as opposed to Over time, I tried to integrate as many of these benefits as I could into CLO. As good as online courses can get, there is no replacement for having a live speaker to practice with. The teachers I had were very good. There was a lot of interaction and they challenged you to come up with new answers to questions, using the Chinese that was taught in class. While most of CLO is designed to be self study, I did try to integrate some of the “live teacher” aspect into the exercises feature. The questions posted there are purposely open ended, like the ones you would hear in a classroom. Submit your own answer in your own format and a real teacher will send you feedback on your grammar and character choices (if your answer was typed) or your pronunciation (if your answer was an audio submission). And of course, we also offer the option of live one on one classes via Skype, if you prefer. I actually got a shock the first day of class when the teacher came in and began speaking a mile a minute. I barely understood 20% of what she was saying. I worried that I was in the wrong class and should transfer to a lower level. Fortunately I persisted. Over time I began to learn these phrases and expressions very quickly as they were repeated again and again in each class. Once I figured out those phrases, there was only 20% of new material. This became a good source of comprehensible input, as I could now learn new material in the context of what I already knew. I found my brain much more in tune at this stage, whereas earlier it would start to tune out when there was too much new material. a) It’s all Chinese that was taught in earlier lessons. b) Most of the phrases are repeated again and again in each lesson. Phrases like “Welcome to Chinese Learn Online, lesson X”, “Let’s listen to today’s dialog at normal speed”, “Let’s listen to the dialog again at a slower speed. Please repeat after her.”, “What does this word mean?”, “Do you remember what that means?” etc. So once you get used to all these phrases (which you should, since you’re hearing them so often), the rest of the lesson should be a breeze, since it’s only 20% or less new material. While in class, other students would ask questions that I hadn’t thought of, that I would learn from. The teacher would also ask the same question to different students around the class, so while you were formulating your own answer to the question, you could also listen in and learn from what other students were responding with. The Comments section in each lesson is meant to emulate this aspect. You can read what questions others have asked and learn from the answers given, or submit your own. While I enjoyed the experience of learning Chinese in a classroom environment, there were also some areas that I wasn’t pleased about, that I felt could be improved. I’ll discuss these issues in the next post. If you happen to be living in a Chinese speaking environment, you may notice a lot of common errors that native Chinese speakers make when they try to speak English. These errors can actually help you learn Chinese, since if you backtrack to see why they make such mistakes, you will often notice references to how Chinese differs from English. Knowing these differences will help in your quest to learn Chinese! Many of the mixups are caused by several words in Chinese having multiple meanings in English, depending on context. So you can expect Chinese speakers to mix these up as the same word is used in multiple situations in Chinese, whereas each situation has its own word in English. Here are some examples. he and she. Often times, you will hear Chinese speakers mixing up he and she while speaking English. You might wonder how one could confuse males as being females and vice versa, until you realize that in Chinese, tā (in speech) can refer to he or she, so the concept of having a different word for each is new to them. (The written form is of course different, as 他(male) and 她 (female) use different characters, but in spoken form, there is no distinction made between the two). borrow and lend. You might hear questions like “Can you borrow me a pencil?” The reason for the confusion of course comes from the Chinese word jiè (借) which is used both for both “borrow” and “lend”. open and turn on. The word kāi (开 / 開) is used for both in Chinese. It even extends to other meanings like drive, start and operate so it’s a wonder it doesn’t get mixed up more often! have and is. This is a big one. There are many situations in Chinese where the word yǒu (有), meaning “have” is used where we would use “is”in English. So as a result you hear English phrases like “There have” instead of “There is”. watch, look and read. The same word kān (看) is used for all three. big. In English, the word “big” is usually reserved for describing the size of a physical object. In Chinese though, dà (大) can be used in all sorts of situations, resulting in English sentences like “The rain is big today” (It is raining heavily) or “Today’s sun is very big” (It’s very hot today). Special. The word for “special” in Chinese, tèbié (特别 / 特別) can be used to say that something is very good. Eg. “This food is very special” which would be an odd usage in English. Terrible. Lìhai (厉害 / 厲害) literally means “terrible” but is often used in Taiwan to mean someone is very good at something (terribly good?). Uncomfortable. In Chinese, saying that you feel uncomfortable, or not shūfu (舒服) is a common way to say that you feel sick. We don’t have this same usage in English. Very. In English, some verbs are modified with very before them, like “very fast”, while other ones require “very much” to be added at the end. In Chinese, they are all “very”, so you end up with phrases like “I very like”. Help. In English, “help” means to aid someone. In Chinese though help also extends to doing something for someone. So if you tell a Chinese person you are going to help them do something, they may hand over the reigns to you to do it on your own, since that is one of the meanings of bāng (帮 / 幫). Can you think of other examples of English words or phrases that are used incorrectly by Chinese, due to differences in how they translate between English and Chinese? The key to learning a new language is finding sources of “comprehensible input”. This is a source of material that is slightly above your current level of understanding. Why is this important? Your brain is remarkably good at identifying and learning patterns. Most of the learning you actually do is done in the background by your brain, without your conscious knowledge. The trick to optimal learning is to put your brain in an environment that it can learn from, and that’s where comprehensible input comes in. 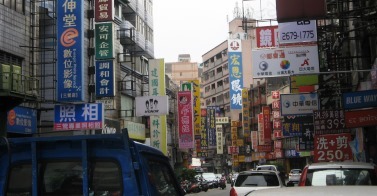 W hen I first came to Taiwan, I was overwhelmed by all the Chinese signs and labels around me. I couldn’t wait for the day when I’d actually be able to understand what they all meant. With so much material around me to “learn” from, I’d be able to pick up Chinese in no time, right? Well, it doesn’t quite work that way. Since all these characters were foreign to me, my brain didn’t know where to begin, and so very little learning could take place. In fact, what I found happening was my brain would instantly pick out the one or two signs that were in English, since that’s all it could decipher! This is why when kids are learning to read, we don’t start them off with Harry Potter. You start with easy to read books with smaller sentences first, then let them work their way up to more difficult material. When learning Chinese, you need to use the same approach. If you’re just starting off, you’ll want to start with some absolute beginner material that introduces you to the basics. Once you’ve learned the basics, you can them move on to more difficult (but only slightly more difficult) material, so that your brain can process the new material in the context of what it already knows. If the new material is too easy, then while it may be fun to absorb, no actual learning will take place. If it’s too difficult, then your brain will give up as there will be too much new information to process. CLO was designed with this approach in mind. Each lesson only teaches a few new words at a time, while reusing words that were previously taught. Dialogs and articles are presented for you in their entirety in the beginning of a lesson, so that your brain can try and process the new vocabulary on its own first, before the explanations are given. If you ever find your learning reaching a rut, where you don’t find your Chinese improving, it may be because there is a lack of comprehensible input being provided to your brain. This happens when you hang around the same people all the time who are speaking at the same levels that you are already used to. If this happens to you, the it’s time to look for new sources of input. Try striking new conversations in new topics that you’re not familiar with. Or try reading or watching a program that is slightly above your current ability. Doing so will ensure that your learning never ceases, and that you’re constantly making new progress. 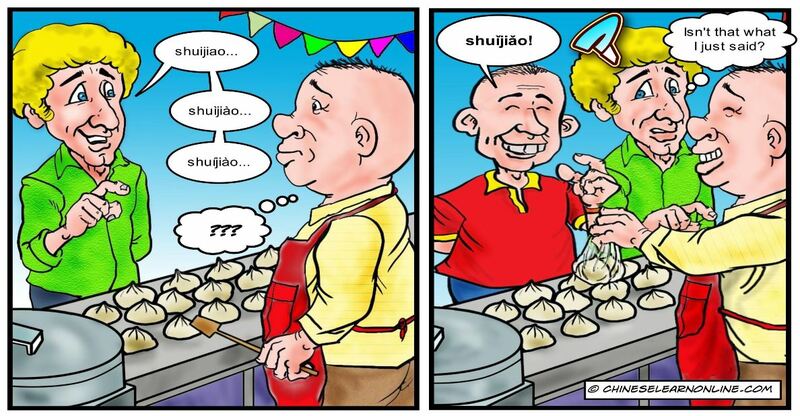 The man on the left is trying to order shuǐjiǎo (dumplings) but he can’t remember what tones to use, so the vendor doesn’t understand him. Along comes the new man on the right who uses the proper tones and thus gets what he wants. To native English speakers, words sound the same even when you change the tones used, but to Chinese speakers they result in completely different words with completely different meanings. So make sure when you’re learning new vocabulary in Chinese, to also make note of what tones to use to avoid being misunderstood! During the first few years of my life in Taiwan, I didn’t take any formal training in Chinese, assuming that I would learn Chinese just by being here. I quickly came to realize that that wouldn’t be the case. I actually had to put some effort into it. The good news was that there was so much Chinese being spoken around me. The bad news was that there was so much Chinese being spoken around me that I didn’t know where to start. I began by learning what I needed to know. Basic greetings, thank you and goodbyes. Vocabulary that I was likely to use on a frequent basis. Using these words and phrases often and actually being understood gave me the confidence to continue my learning journey. From here, I began to learn the names of objects around me that I was likely to interact with or name on a daily basis. If you’re a teacher, then these may be objects in a classroom. Listen to how students identify them and learn them for yourselves. Start with the most frequent objects and work your way down. The trick here is to focus on the vocabulary that you’re likely to use regularly since this makes it easier to stick. If you learn a word that you’re not likely to use in the immediate future, then you’re more likely to forget it. Save it for later. The reason we focus on widely used vocabulary at this early stage is that your brain is still getting used to this new language that is so different from the languages you’ve learned in the past. So it’s important that it’s getting exposed to constant repetition. Later when you’re more comfortable in the language, you’ll find it easier to learn lesser used vocabulary as new words will now be placed in context of words you already know. Right now at this early stage, you don’t have this context so what can be remembered is limited to what you’re exposed to often. By now, you’ve learned basic greetings and basic vocabulary that applies to your daily life.Perhaps you’ll recognize some of these terms when people around you are speaking. However there is still a lot that you don’t understand. Instead of trying to learn it all, try and pick out a few words or phrases that you hear often. For me it was phrases like Méi guānxi, bú yòng and kěyǐ. I didn’t recognize any of the words before or after those, but I kept hearing these words over and over again. I asked the people around me – “What does bú yòng mean?” Slowly I learned these expressions, and started to pick these out even more, now that I knew what they meant. 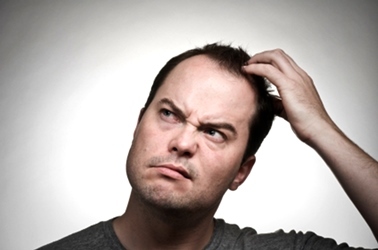 You’ll find yourself in situations where clerks or the people around you ask you the same questions all the time. For me, it was at the grocery store, when the clerk would ask me if I wanted a bag, or if I had their store’s member card. Early on, I had no clue what they were asking and generally ignored it (they tended to move on if they sensed you didn’t understand, which suggested to me that their question wasn’t very important to begin with). Now that your goal is to improve, you’ll need to find out what these questions are. Get someone to come with you and translate exactly what they said, including the exact words they used. There may be a lot to take in, but again since these are questions you’re being asked frequently, you’ll be able to pick it up quickly. In most cases you’re only answering with a méiyǒu or bú yòng so it’s not exactly rocket science. It will increase your confidence though to know exactly what it is they asked you! You are now ready to move into a more active mode. Look for situations in your life that you’ve been able to handle so far with minimal Chinese. Perhaps it was ordering food, or filling up gas. It is now time to find the exact words and phrases you need to accomplish these tasks – no more pointing or miming! 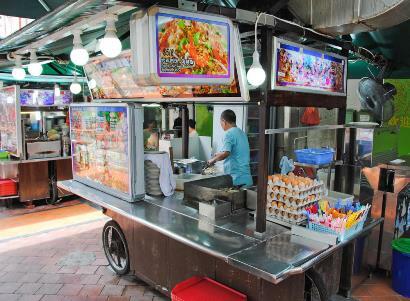 One of the best places to improve in this area is when you’re standing in line. In most cases, the people in front of the line are accomplishing similar tasks – what words and phrases are they using? If that’s not enough, you may need someone’s help initially to say exactly what you want to say. If the task is complicated then you may have to use a mixture of Chinese and pointing, but at least make the attempt. Over time you can replace the pointing with new Chinese you pick up along the way. If you follow all the instructions above, you’ll eventually get to a stage where you know the names of all the objects you interact with regularly, and you know all the phrases that get you through the day. At this point, it’s easy to get comfortable – after all, you know all the Chinese you need to know. Imagine if your mom could see you now! But yet you know that’s not enough. You still have no idea what other people on the street are saying when they are talking to each other. So how do you make the next jump? It is time to start learning alternatives to what you already know how to say. You know how to order your lunch box like a pro (you better know how, since you’ve been ordering that same lunch for the past three years!). It’s now time to start looking for new ways to accomplish the same task. When you’re in line and listening to the people in front of you, notice that they don’t all the use the exact same expressions. Some will use an alternate form. It’s now time to start learning what these alternate forms are. So instead of asking hǎo ma all the time, switch it up with a hǎo bù hǎo instead (yes, be dangerous!). And while you’re at it, why don’t you try eating something different for a change? You’re now at the cusp of greatness. You live your life like a boss. You feel like you’re practically one of the locals. But you know deep inside that you’re far from it. It’s time now to take things to the next level. Move outside your comfort zone. Before you start kicking and screaming, remember that you already moved outside your comfort zone by coming here in the first place. Your friends are still back home, liking your Facebook posts from the comfort of their home, but you’re here! So why stop just before the finish line? It’s time to make new friends. Local friends. Join some clubs. Volunteer. Do anything – just get out there interacting with people. Engaging in new experiences will expose you to new situations where you’ll need to learn new Chinese to keep up. The good news is that you already know what you need to do to get up to speed. Follow the same steps you did above. Rinse, wash and repeat. Following the steps above will take you a long way from “just getting by” to being able to master the Chinese you know to experience local life here. If you have any additional tips to learning street Chinese that aren’t covered above, do share them below!